Welcome to the Island of Hispaniola and the Dominican Republic. 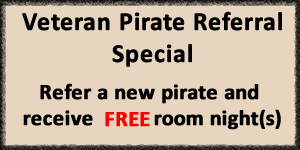 We invite you to experience our island life – the “Blackbeard's Pirate Way”! With miles of sandy beaches and swaying palm trees and a friendly smile from everyone you meet, the Dominican Republic will steal your heart away. Our crew at Blackbeards will cater to your every need. 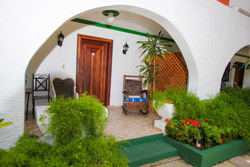 From the moment you arrive and set foot inside our Spanish style courtyard hotel, you become part of our family. 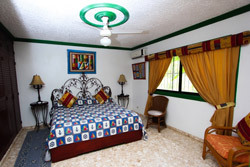 We will do whatever it takes to make your stay here everything you ever dreamed of and……much much more! Our 22 spacious rooms all have their own character. No two are the same. 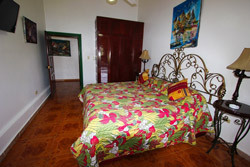 Our room variety included standard singles, deluxe singles, deluxe doubles, Jacuzzi suite and a beautiful Penthouse. 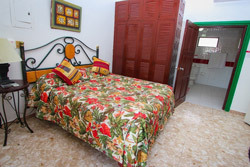 Each colorfully decorated room includes: Air Conditioning with remote, Spacious and comfortable king or queen size beds, Ceiling fans, HDTV cable, Mini bar refrigerator stocked with the essentials, Tiled bathrooms with plenty of hot water, Free Lock boxes, Daily maid service and laundry, Laundry service available at nominal fee, Free Wi-Fi internet service throughout the hotel, and Billiard table in our lobby. 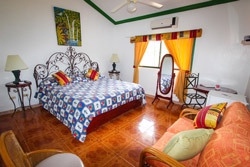 Nestled around our colorful courtyard, our rooms are surrounded by coconut palms, aromatic bougainvilleas, hibiscus, jasmine, gardenias, banana trees and a fanfare of other tropical flora. The perfect backdrop for your island vacation. 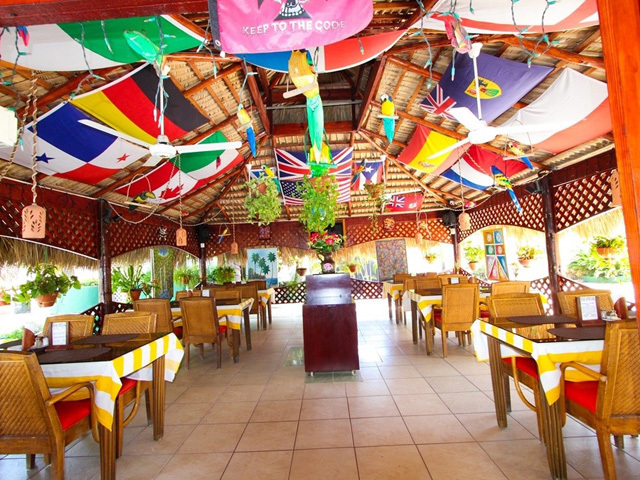 Drunken Parrot Bar and Restaurant – drink, eat, dance to our island music or just shoot the breeze with your friends or watch a game on one of our big TV’s. Our Dominican Roast coffee is hot and always free and our beer is always ice cold. Breakfast service starts at 8a.m. and the restaurant is open until 11p.m. 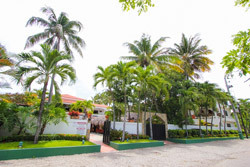 With a wide range of delicacies starting with fresh garden and fruit salads, special appetizers, seafood, Italian and American favorites as well as local Dominican fare. Our friendly staff is well known for their prompt and friendly service and attention to detail. Whether you choose to dine indoors or outside, under one of our many authentic thatched roof tables, we are confident you will enjoy a romantic dinner, while surrounded by the warm Caribbean breezes. Crows Nest Bar – Or “ Bar Arriba ” as we say here. Our upstairs air conditioned bar is party central for dancing, disco, big screen sporting events and much more. Open Thu-Fri-Sat Nights and the festivities kick-off at 9pm. 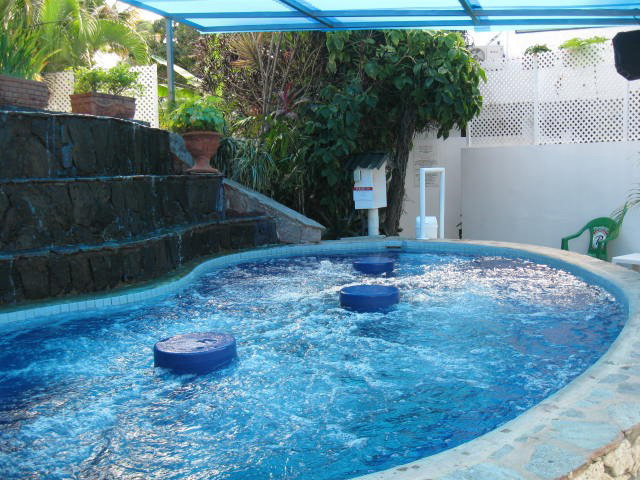 Jacuzzi – a private hide away to relax, soak your troubles away and enjoy a cold beverage. Our oversized Jacuzzi features a waterfall, hot water, bubbles and has enough room for 20 people. Ring the bell and we will deliver your beverage or towel to you. Pool – our large tropical lagoon style pool is a great place to cool down and enjoy a fresh tropical drink. How about a game of water volleyball - Guys in the deep end, girls in the shallow end. Poolside activities daily!! Tour Desk – We offer a wide variety of fun and exciting land and water tours. Everything from a countryside excursion visiting the famous Damajagua Falls to sailing, fishing, snorkeling, diving, horseback riding and more. Make your vacation special – get out there and have fun! Currency Exchange Service – Currency Exchange Service – Our front desk offers currency exchange to Dominican Pesos for U.S. Dollars, Canadian Dollars, Euros and British Sterling. Sorry – due to difficulties here with the Dominican Republic Banks refusal to accept them for deposit – we can no longer accept any type of Travelers Checks.